Zinc One Resources (TSX-V:Z) reported that all data from its 2018 drill program at the Bongará zinc mine project in Peru is now compiled, interpreted and modeled. NuLegacy Gold (TSX-V:NUG) received final approvals of its Avocado plan of operations permit as well as its Foothills notice of intent permit. The Oreninc Index grew in the week ending November 30th, 2018 to 45.78 from an updated 37.81 a week ago as the G20 meeting took place in Buenos Aires, Argentina. A busy political week as world leaders gathered in Buenos Aires for the G20 meeting. They largely shunned Saudi Crown Prince Mohammed bin Salman due to the cloud hanging over him due to the murder of journalist Jamal Khashoggi. Except Russian leader Vladimir Putin. A misunderstanding by US president Donald Trump saw him walk off stage while event host, president Mauricio Macri of Argentina, was inviting him to participate in a group photo. Trump was perhaps happy to be enjoying the Buenos Aires spring as back home his former lawyer Michael Cohen pleaded guilty to lying to Congress during its investigation into the president’s involvement in a potential Russian business deal during the presidential campaign. In the UK, prime minister Teresa May prepares to take her deal for the UK to leave the European Union to the lower house for ratification. Parliamentarians on all sides say that it is a bad deal, including several of her cabinet ministers who have resigned, with an increasing number of people saying that there needs to be a second referendum vote on the issue now that there is a greater understanding of what is at stake. Failure to get the deal passed by the house of Commons could prompt a vote of no confidence in the government. In the US, the US Federal Reserve policy minutes showed that members were virtually unanimous that another US interest rate rise soon is warranted. They also supported comments the day before by Chairman Jerome Powell during a speech to the Economic Club of New York in which he commented on the need to take the foot off the gas in 2019 and have fewer interest rate increases going forward. On to the money: total fund raises announced more than doubled to C$97.5 million, a six-week high, which included no brokered financings, and two bought-deal financings for C$25.0 million, a six-week high. The average offer size increased to C$2.9 million, a two-week high, whilst the number of financings increased to 34, a six-week high. Gold returned to its up-and-down ways as it closed down at US$1,220/oz from US$1,223/oz after recovering from a low of US$1,215/oz. It is down 6.32% this year. The US dollar index showed more growth closing up at 97.27 from 96.91 last week. The van Eck managed GDXJ retreated again as it closed down at US$26.59 from US$27.27 a week ago. The index is down 22.09% so far in 2018. The US Global Go Gold ETF closed down as well at US$10.20 from US$10.44 a week ago. It is now down 21.60% so far in 2018. The HUI Arca Gold BUGS Index closed down at 145.04 from 147.82 last week. The SPDR GLD ETF shed some inventory to close down at 761.74 tonnes from 762.92 tonnes a week ago. In other commodities, silver continued to give up cents as it closed down at US$14.20/oz from US$14.29/oz a week ago. Copper meanwhile remained even at US$2.78/lb. Oil continued to hover around the US$50 a barrel level as WTI closed up at US$50.93 a barrel from US$50.42 a barrel a week ago. The Dow Jones Industrial Average put on some strong growth as it closed up at 25,538 from 24,285 last week. Canada’s S&P/TSX Composite Index also closed up at 15,197 from 15,010 the previous week. The S&P/TSX Venture Composite Index also closed down again at 589.52 from 602.15 last week. Number of financings increased to 34, a six-week high. No brokered financings were announced this week, a two-week low. Two bought-deal financings were announced this week for C$25m, a six-week high. Total dollars heightened to C$97.5m, a six-week high. Average offer size raised to C$2.9m, a two-week high. SilverCrest Metals (TSX-V:SIL) announced a non-brokered private placement a strategic investment from SSR Mining that agreed to purchase 8.2 million shares @ C$3.73 for a total investment of C$30.7 million. SSR will own 9.9% of SilverCrest. The company will use the proceeds for exploration and development of the Las Chispas project in Mexico including a resource update, completion of a Preliminary Economic Assessment, construction of an exploration decline, and an infill and expansion drilling program. Barkerville Gold Mines (TSX-V:BGM) entered into an agreement with a syndicate of underwriters led by Haywood Securities to purchase on a bought deal private placement basis, 14.7 million shares @ C$0.34 and 40.0 million flow-through shares @ C$0.50 for total gross proceeds of C$25.0 million. The proceeds will be used to advance the Cariboo gold project in British Columbia, Canada. Closing is expected on or about December 18th. Silvercrest Metals (TSX-V:SIL) opened a C$66 million offering on a strategic deal basis. The deal is expected to close on or about December 7th. Barkerville Gold Mines (TSX-V:BGM) opened a C$25 million offering on a bought deal The deal is expected to close on or about December 18th. MGX Minerals (CSE:XMG) opened a C$02 million offering on a best efforts basis. Each unit includes a warrant that expires in three years. The deal is expected to close on or about November 26th. Fura Gems (TSX-V:FURA) opened a C$25 million offering on a best efforts basis. Noront Resources (TSX-V:NOT) closed a C$15 million offering on a best efforts basis. The data will be used to complete an independent mineral resource estimate for the near-surface, high-grade, zinc-oxide mineralization encountered at the Mina Grande, Mina Chica and Bongarita deposits expected to be released in early 2019. The mineral resource estimate will be the basis for a Preliminary Economic Assessment expected to be completed late in 2019. Zinc One has applied for approval to drill 583 holes from 364 platforms along a 1.4km long ridge from Mina Chica to and beyond Mina Grande Sur for delineation and infill drilling on a nominal 30m grid spacing and the exploration holes on a nominal 50m drill grid. 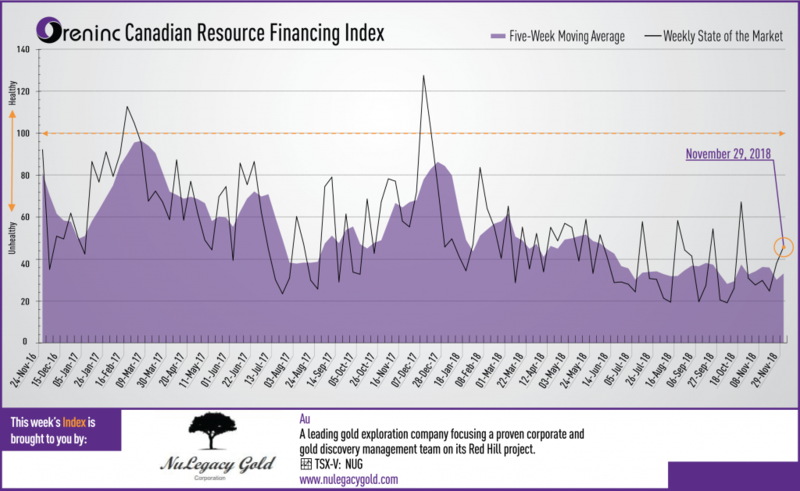 These permits should enable to current ten-hole exploration program to be completed without delay and the planning of the 2019 exploration drilling program can commence once the assays from the fall program are in hand. The Avocado POO is a significant asset as the baseline studies that were completed for it are essential for the development of Avocado. The POO is an environmental permit and the larger disturbance allowance will give the company more flexibility in planning and permitting the drill sites required for the expansion and delineation of the Avocado gold deposit during the 2019 drill season. The Foothills NOI allows for the drilling of the first two holes into this new target.